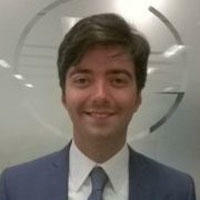 Dr. Christian Mastrodonato is Chief Technologist within Business Innovation for Europe. During his carrier he led different strategic, engineering and research projects applying Semantic and IoT technologies in different vertical sectors, like e.g. Aerospace, Construction, Energy, Healthcare and Smart Cities. Currently as lead technologist/architect he manages and drives technical projects and provide technical strategic leadership in Business Innovation. He is dedicated to ensure the success of business incubation from technical perspective, engage in technical sales process and client engagement including design of proof of concepts and system architectures, and provide the necessary handoff into appropriate sales and service channels in commercialisation phase. Previously, Dr. Mastrodonato was responsible for Knowledge Management Business Unit in D’Appolonia. He also holds both a M.Sc. & Ph.D. in Physics (Statistical Physics & Quantum Mechanics).